According to Dr. Matthew Edlund, many people aren’t just sleep-deprived, they’re rest-deprived. This results in an overload on the heart, mind, and the central nervous system putting your health at risk. People believe that sluggishness and fatigue are the side effects of hectic lives, and that sleeping for another hour or two is the answer. Getting enough sleep is important, but it’s only one part of a much larger spectrum of rest. The benefits of making time for rest includes look younger, healing faster, losing weight more effectively, and experiencing greater joy in their work and their relationships. Here, Dr. Edlund gives us some insight into the four crucial types of active rest we can incorporate into our daily lives. Sleep is one form of passive physical rest, but engaging in active forms of physical rest is also crucial. Active physical rest includes breathing exercises, timed naps, baths, and yoga poses. When doing breathing exercises, you want to open the bases of your lungs and really relax. Stand straight, breathe in on the count of four, out on the count of eight, feeling your chest move up and out as you breathe in. long a nap may lead to sleep inertia, a leaden feeling from getting into deeper phases of sleep. While we need to rest the body, it’s equally important to learn to focus and concentrate on the mind. Mental rest involves reconfiguring one’s mind to quickly and easily obtain a sense of relaxed control. Self-hypnosis, relaxation, and visualization help maximize this process. For example, when using visualization, one simple technique is to walk to music. Choose your favorite upbeat town, feel it in your bones, and walk to it for 20 to 30 seconds at work or at home. If you can, walk over to a friend or work colleague you’d like to talk to. Or try to focus all your attention on some aspect of nature for just a minute. It can be a tree, a flower, a branch. Notice everything about it, if you can, even feel it. All such techniques reset your attention and perception, which can increase creativity and productivity. Humans are hardwired to be extremely social—social connectedness is built into the structure of our brains. Studies show that people with strong social connections live longer, cope with stress better, and are healthier. Phone one of your best friends and say you want to be able to call her anytime, anywhere, for a minute, when you’re stressed, because you value her opinions so much. See if she agrees, and try it weekly for a while. Social rest leads to social connection, a critical factor in preventing heart disease and stroke as well as depression. Take a walk outside, especially in a park, with a friend, which should improve mood; cause new brain cells to grow in memory areas, during sleep; activate natural killer cells; reset biological clocks; and help prevent heart disease. Certain spiritual practices can provide a profound sense of rest, inner peace, connection, and self-healing. Scientific studies have demonstrated that meditation can actually change the structure of the brain over time. Meditation, prayer and contemplation can bring renewal and a sense of well-being. do the same with the rest of the building, the street, the town. The enormous amount of information and history this represents can give people a sense of awe and perspective, very, very quickly. 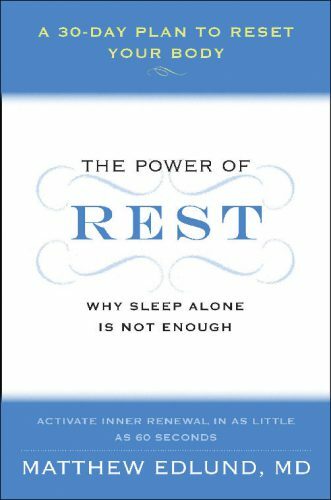 All these techniques and many more can be found in Dr. Edlund’s latest book THE POWER OF REST: Why Sleep Alone is Not Enough. This step-by-step 30-day plan introduces one simple, no-cost technique each day, many of which can be accomplished in just a minute or two.